★ Personally visited. Our own photography. Specially chosen accommodation in Scotland. 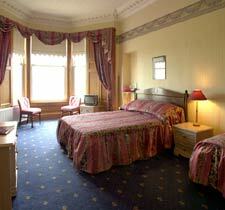 Bed and Breakfast Accommodation in Edinburgh. Free wireless broadband internet access. Free off-road parking. Non smoking. 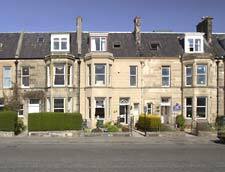 Heriott Park Guest House faces south and has a wonderful panoramic view of the city of Edinburgh over the playing fields of George Heriot's. You can see the whole skyline of the Royal Mile leading up to Edinburgh Castle. 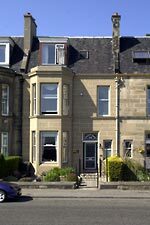 Gary Turner and Stewart Thom offer a warm welcome to Heriott Park which has bed and breakfast accommodation ideal for single people, couples, families and large parties of friends travelling together, (-and an option of 2 self-catering apartments next door). There are buses every 10 minutes (journey time 10 minutes) to the city centre (under 2 miles). A Daysaver ticket gives unlimited bus travel in Edinburgh for £3.50. Or it takes 30 minutes to walk via the Royal Botanical Gardens. The Royal Yacht Britannia is moored about a mile away, and, also within walking distance, there are lots of pubs, bars and restaurants in nearby Leith. Family bedroom (above left and right). All bedrooms have private shower-room/wc en suite. Digital Freeview televisions in all bedrooms. Free wireless internet access for your own laptop in every room. All in all: Heriott Park Guest House has 7 double/twin rooms with en-suite shower/wc and 8 family rooms with en-suite shower/wc ranging in size from family of 3 to family of 5. Breakfast is served in the Dining Room between 8.00am and 9.00am, (or earlier, by arrangement), and comprises a buffet selection of cereals, fresh fruit, fruit juice and yoghurt. - or a full scottish breakfast of sausages, bacon, eggs, tomato and baked beans cooked to order. Tea, coffee, toast, etc., is served at your table. 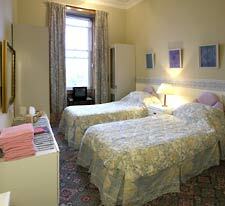 Double/Twin £30 to £60 per person per night. 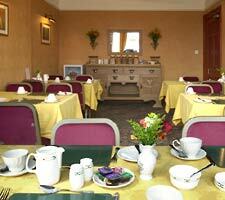 Family rooms £30 to £50 per person per night with discount for children under 14 sharing rooms with adults. 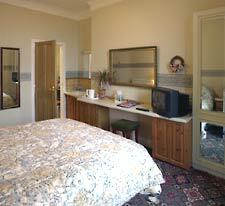 Single occupancy varies from £35 to £80 per night. See also Stewart's rental accommodation next door: Heriott Park self-catering apartments. 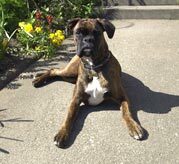 Please tell Gary and Stewart you found Heriott Park Guest House through About Scotland!